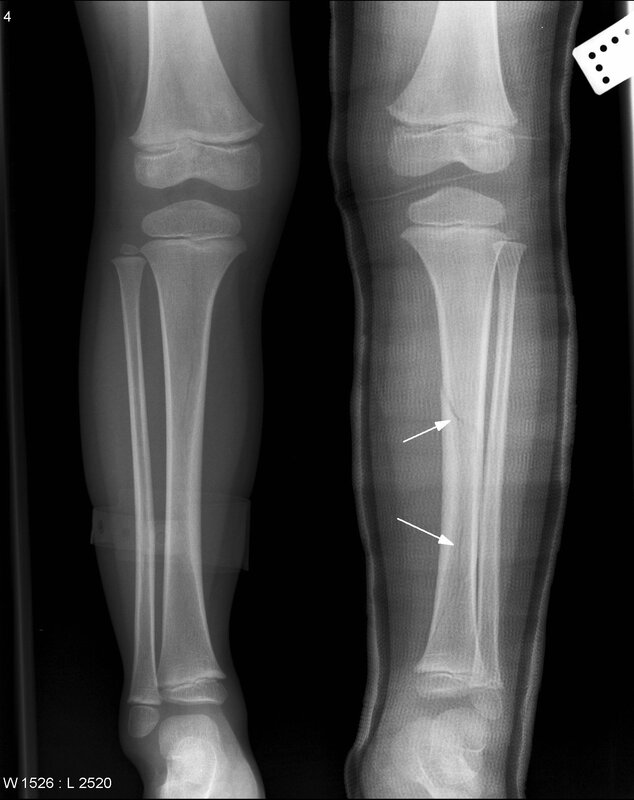 This pathway provides guidance on imaging a child suspected at risk of 'non accidental injury'. Move the mouse cursor over the PINK text boxes inside the flow chart to bring up a pop up box with salient points. Clicking on the PINK text box will bring up the full text. The relative radiation level of each imaging investigation is displayed in the pop up box. 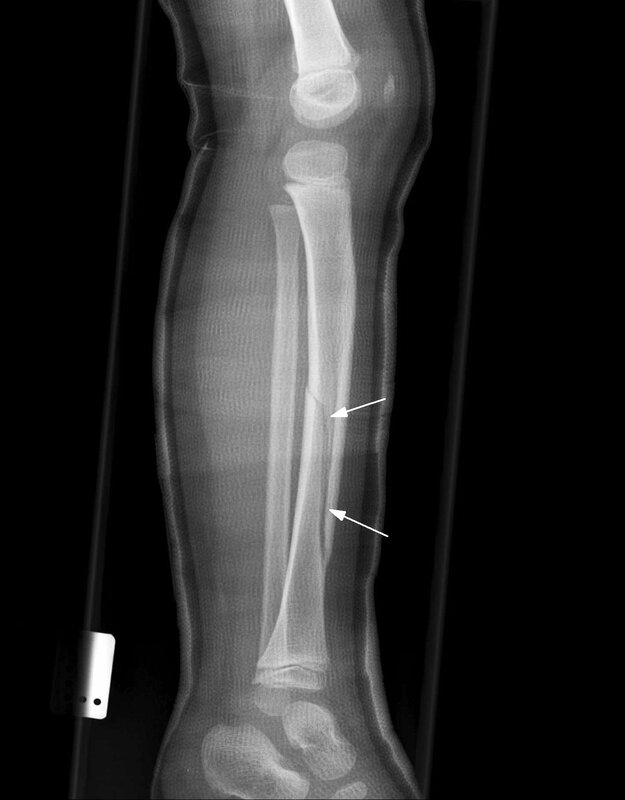 Image 1a, 1b and 1c (Part of Skeletal Survey): Acute 9cm spiral fracture affecting the mid to distal shaft of the left tibia with slight posterior displacement (arrows). 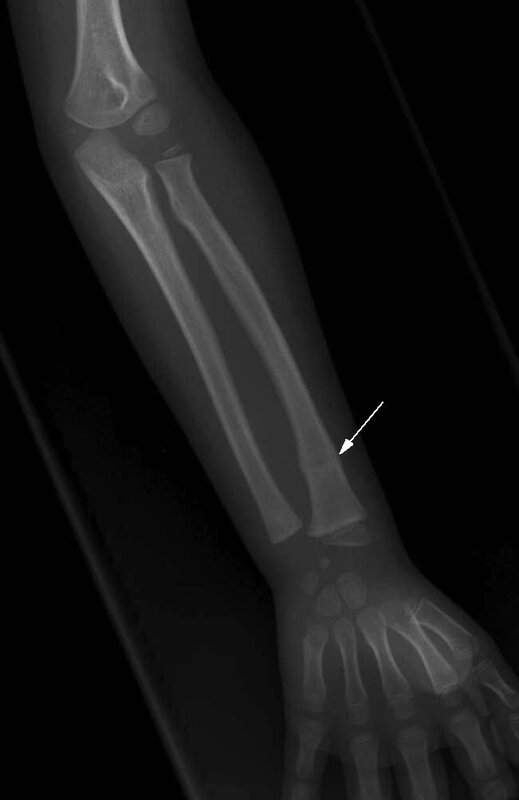 A healing left distal radial fracture of a few weeks duration is also noted (arrow). No other abnormalities were seen on the other films comprising the skeletal survey which are not illustrated here. Kleinman PK (ed). Diagnostic imaging of child abuse, 2nd ed. Mosby, St. Louis, 1998. © Copyright 2015, Department of Health Western Australia. All Rights Reserved. This web site and its content has been prepared by The Department of Health, Western Australia. The information contained on this web site is protected by copyright. Some documents for download on this website are in a Portable Document Format (PDF). To read these files you might need to download Adobe Acrobat Reader. All contents © 2019 Government of Western Australia. All Rights Reserved.